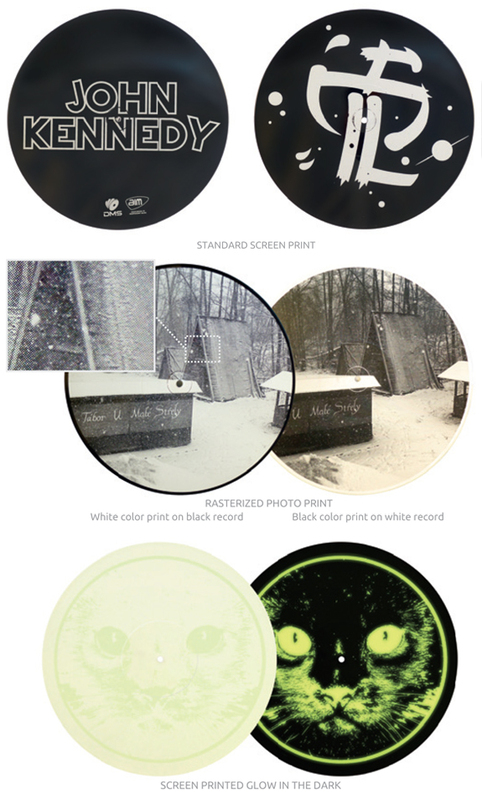 One of the new trends in vinyl is to make a one-sided record, and to screen print a design on the side with no music. This type of a record can be made with virtually any combination of colored vinyl and screen printing ink to create amazing art pieces. Most commonly we print using only one color, however we are able to print up to 5 colors. Please note: These can make a great merch item, but this specialty product does carry with it some inherent risks. All one sided records have a tendency to warp more, especially when a center label is not used on both sides. Also, just due to the nature of silkscreening on plastic, depending on how they are packaged, the ink can have a tendency to chip/peel off over time. Printing in the center of the record (30-40mm) is not recommended because although we can do it, that area will usually not print cleanly and the ink will chip away much easier. None of these issues can be subject to claims.